Hillary Clinton's latest hard choice: How will she solve her Bernie Sanders problem? It may not be reflected in the polls just yet, but Vermont Sen. Bernie Sanders’ presidential campaign — which he officially launched only just this week — has gotten off to a fantastic start. Since conventional wisdom holds that her centrist position on the Iraq War cost Clinton the nomination in 2008, it’s unsurprising to hear that the new campaign’s goal is to avoid making the same mistake twice. And as a lefty who expects Clinton to ultimately win the nomination, I’d be thrilled if this were her only takeaway from ’08. The most likely consequence would be that she stops worrying so much about the center and focuses more on inspiring her base. This isn’t mere speculation; as her new positions on marriage equality, criminal justice and immigration reform attest, she’s done it already. Exciting as this scenario is, though, it’s not guaranteed. And the reason it’s not guaranteed is because that aforementioned explanation for Clinton’s defeat in ’08 — that it was all about Iraq — isn’t correct. There’s no doubt that voters’ feelings about the war played an important role in deciding that race, but it was hardly the lone reason Obama won. As is often the case in primary elections, Obama and Clinton differed little on policy; it was style, personality and demographics that ensured the current president came out on top. 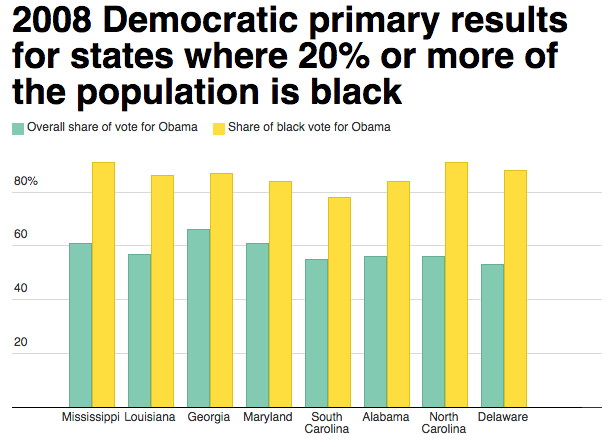 As Vox’s Andrew Prokop notes, Obama’s stance on Iraq was enough to earn him a fair hearing from voters, but it’s his success with African-Americans that best explains why he won. “Obama won every primary in the eight states where more than 20 percent of the population is black,” Prokop writes, “and sometimes racked up huge margins in them.” According to Prokop, the roughly 100 delegates Obama won from those 8 states was “close to the margin of his pledged delegate lead when the primary season ended.” It’s simple, really: If not for unprecedented levels of African-American support, Obama never becomes president. So what does Barack Obama’s experience in 2008 have to do with Bernie Sanders’ in 2016? Another story from Vox, this one from Dara Lind, provides an answer. Titled “Why Bernie Sanders doesn’t talk about race,” the post takes a closer look at an element of Sanders’ record that many white supporters of the socialist Senator have either forgotten or chosen to ignore. As you might guess, the omission hasn’t been much of a problem for him in Vermont, where 1.2 percent of the population is black. But the Democratic primary could be a much different story. Remember, Sanders is not a liberal; he’s a socialist. Within the world of leftist politics, his position is far from unheard of or unique. Here’s the thing, though: the Democratic Party is not a socialist party, and most Democratic voters are not themselves socialists, either. Abstract arguments about the relationship between the class war and racism may get us closer to the truth of the world, but they don’t make for a very good platform from which to run a presidential campaign. And Sanders’ neglect of racial politics leaves him vulnerable to what could ultimately be a devastating attack. All of which brings me to the second, and much more depressing, way Clinton’s campaign might respond to Sanders, if they do indeed consider him a real threat. It’s not particularly complicated. Clinton could note that the first two speeches of her campaign were about examples of racial injustice (mass incarceration and the plight of undocumented immigrants) and she could contrast that with Sanders’ relative silence in order to portray him as an out-of-touch white guy who cares more about the “professional left” than “everyday Americans.” Throw in a little of the media’s predictable talk of a “wine track” and “beer track” within the Democratic electorate and — boom! — Sanders becomes this election’s version of a way-less-weird Dennis Kucinich. Hopefully, that’s not how things play out. Hopefully, Clinton tries to eliminate whatever challenge Sanders poses by moving toward him on policy instead of going scorched earth in retaliation. The Politico report gives reasons to be optimistic — the Clinton campaign’s worry about alienating Sanders voters chief among them. But this tension between race and class within the Democratic coalition applies well beyond the 2016 primary. And it would be tragic if Sanders’ campaign, which has started out with so much promise, was undone by the same forces that have forestalled progress in American time and time again.